Bandaje Arbi Falls, one of the breathtaking waterfalls in the Western Ghats, is located near Mundaaje, in Dakshina Kannada District of Karnataka. It cascades down from a height of 200 ft. Ballalarayana Durga is visible from the topmost point of the hill about an hour's walk up from arbi. This waterfall can also be reached by sunkasaale and Ballalarayana Durga. 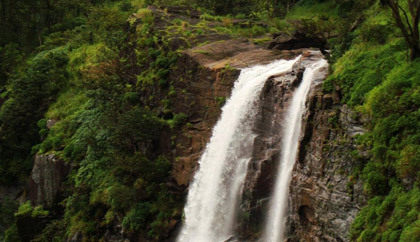 By Road: Bandaje Arbi falls is 350 km from Bangalore and takes almost 7 hours to reach there. Distance from Dharmasthala to Bandaje Arbi Falls, Kishore, Valambra House, Kadivithwara Village, Belthangady, Karnataka is 23.8 km and travel time is around 41 min via Mangalore - Dharmastala Highway/Ujire-Dharmastala Road and NH234. A state transport or private bus from Dharmasthala to Mundaaje (16kms) or to Sunkasaale (83kms) can be the starting point of the route.